Innovation in Environmental Leadership offers innovative approaches to leadership from a post-industrial and ecological vantage point. 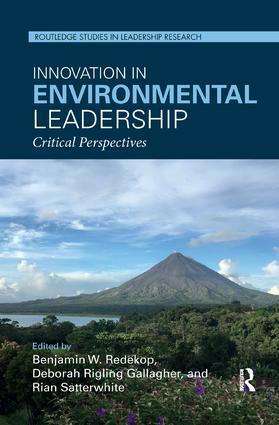 Chapters in this collection are written by leading scholars and practitioners of environmental leadership from around the globe, and are informed by a variety of critical perspectives, including post-heroic approaches, systems thinking, and the emerging insights of Critical Leadership Studies (CLS). By taking the natural environment seriously as a foundational context for leadership, Innovation in Environmental Leadershipoffers fresh insights and compelling visions of leadership pertinent to 21st century environmental and social challenges. Concepts and understandings of leadership emerged as part of an extractive industrial system; this work asks its readers to re-think what leadership looks like in an ecologically sustainable biological system. This bookprovides fresh insights and critical perspectives on the vibrant and growing field of environmental leadership. It shows the latest state of knowledge on the topic and will be of interest both to students at an advanced level, academics and reflective practitioners. It addresses the topics with regard to leadership theory and environmental leadership and will be of interest to researchers, academics, and students in the fields of sustainability, environmental ethics, natural resource management, environmental studies, business management, public policy, and environmental management. 4. Sustainable Leadership: Toward Restoring the Human and Natural World. 5. Eco-leadership, Complexity Science, and 21st Century Organizations: A Theoretical and Empirical Analysis. Benjamin W. Redekop is Professor of Leadership Studies at Christopher Newport University, USA. Deborah Rigling Gallagher is Associate Professor of the Practice of Environmental Policy at Duke University, USA. Rian Satterwhite is Director of Service Learning and Leadership at the University of Nevada, Las Vegas, USA.